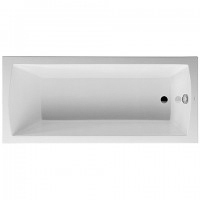 Naturalness and elegance form a perfect symbiosis and are represented with the Duravit Daro rectangular bathtub. Due to its curved lines, the Duravit Daro bath perfectly matches many ceramics and bathroom furniture from Duravit, a Duravit bathtub made of sanitary acrylic and of course corresponding to the traditional standard of Duravit quality. Discover the ease of Duravit Daro bath as built-in version in our bath shop and choose from different sizes.